Scania’s Executive Vice President, Commercial Operations, Mathias Carlbaum. At a press evening in London, senior Scania personnel updated journalists on the performance of the company over the past 12 months and gave some insights into the way they see the business going in the next year. Inevitably, much of what was said focused on trucks with the recent launch of ‘The Next Generation Scania’ range, a model range that has been warmly received and already carried off the International Truck of the Year 2017 title. Readers of B&CB are not generally that interested in trucks but developments seen on them often herald further developments impacting on bus and coach products. 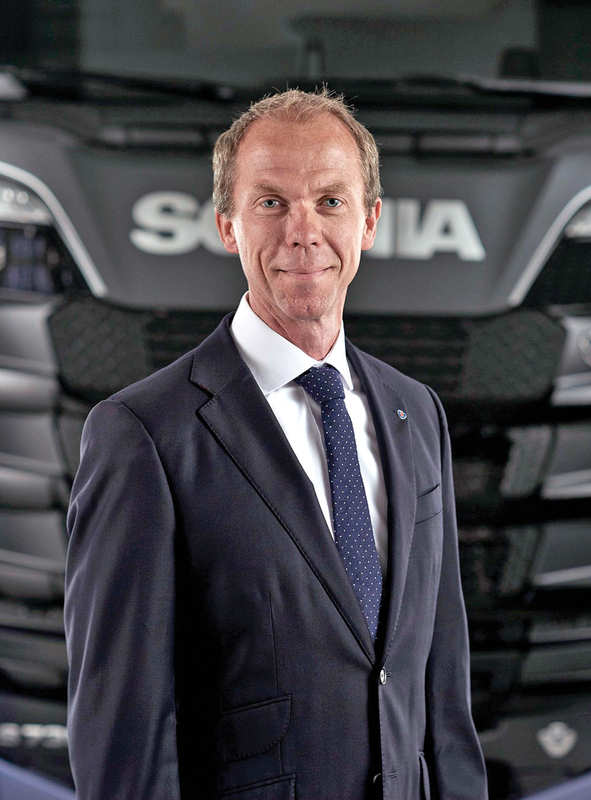 Over from Sweden for the event was Scania’s Executive Vice President, Commercial Operations, Mathias Carlbaum, who said that he could not go into detail on financial matters until the corporate results were announced on 20 March. However, he was able to reveal that Scania deliveries were up 6% in 2016, up 14% in Europe and the UK was Scania’s biggest market, slightly bigger than Germany. This was despite the size of the truck market in Brazil (frequently Scania’s biggest market) dropping from 92,000 units three years ago to 30,000 last year. He said that Scania’s focus was on sustainability, spoke of its three core values of respect for the individual, customer first and the elimination of waste (which also meant maximising quality) and stressed Scania was looking to maximise energy utilisation in its whole value chain. MD Scania, Great Britain Ltd, Claes Jacobsson. 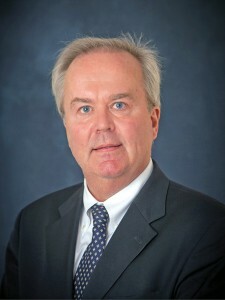 Turning to alternative fuels and showing details of the options available on trucks, he said that all trucks leaving the factory were capable of running on an alternative fuel. Scania was already involved in Swedish-German electric truck trials (using overhead electric catenary) that were about to be extended and had been chosen for truck platooning trials in Singapore. He also mentioned the beginning of battery electric bus field tests in the northern Swedish city of Östersund where Nettbuss will operate three Scania Citywide LFs from the end of 2017. Charging at stations at each end of the route will take ten minutes. They will be joined by three more early in 2019. ‘We can provide interesting electrical solutions that we think are going to be important,’ he said. Concluding, he emphasised Scania’s wish to stay close to developing technologies, announcing that it had set up an independent company, Scania Growth Capital, with funds to invest in ‘promising, innovative and entrepreneurial’ start up companies. Although it might take board positions, it would not interfere in their running. Likely fields for investment include: digitalisation, autonomous vehicles, connectivity, hybridisation, renewable fuels and smart factory. The board would decide on the first investment this week and there were already 100 applications. MD of Scania (Great Britain) Ltd, Claes Jacobsson, said that it would be a struggle to stay Scania’s number one market in 2017 ‘but we’ll give our colleagues a fight for it.’ He had not expected 2016, which was Scania’s 125th anniversary, to be such a great year and at the current time he was expecting the market to settle a bit in 2017 and probably drop a bit. Presenting the more detailed story on bus, coach and engines was Bus, Coach & Engine Director, Tony Tomsett. After first talking about engines, a market in which Scania is number one in Europe, Tony turned to the bus and coach sector. He was upbeat about an increase in orders from fleet customers, which had been achieved for numerous reasons. Scania was seeing the return to orders from loyal bus customers especially in the bus sector. 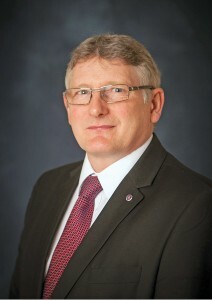 Bus, Coach & Engine Director, Scania, Great Britain Ltd, Tony Tomsett. On biogas, he said Scania had embarked on a ‘real structured and environmental gas drive in the UK and it had been very well supported by our colleagues in Sweden. As a consequence we are regularly receiving requests for information and are offering vehicles to customers’ with 2016 seeing the first orders for double deck gas vehicles in the UK. The vehicles for Reading were going in now and working extremely well. There was also an order for biomethane powered Scania ADL Enviro400CBGs from Nottingham City Transport and there were more biogas orders to come. ‘I will be able to announce other order for gas vehicles soon, particularly for double decks in the UK,’ he said. On retails sales, he said the Scania Touring coach, built in China by Higer, had been a real success. Aided by the launch of the 4×2 version to join the 6×2, sales had risen from 20 in the first year to 40 in the second year. The biggest order so far had been the ten taken by Omega in the spring of 2016. It had been sad to say goodbye to the OmniExpress product in 2016 but they had chosen to celebrate it rather than lament it by creating the OmniExpress Finesse, a very highly specified coach. They had taken a chance by ordering 25 and these had sold out before they were built. There was an exceptional relationship with Irizar prompting Tony to say, ‘Our relationship is gaining in strength year on year.’ Twenty Irizar bodied Scanias had been sold to City Circle in 2016 and on the back of that success a further 16 had been ordered for 2017, deliveries of which would start soon. Though the OmniExpress had gone, there was a new model, the Interlink HD, the reaction to which had been ‘unprecedented’ with the real expectation of achieving sales of over 50 units within the first year of its appearance. Like the OmniExpress, it is built at Scania’s Finnish plant. In the past Scania offered a specialist school coach option based on the Irizar InterCentury called the iSkool. Following interest from the Leicester based operator, Ausden Clark, at the Euro Bus Expo show last year, Scania decided to look at the possibility of building an i4 based iSkool on a three axle K360IB 6×2*4 with two-pedal Opticruise transmission. It was not feasible to produce it as a 4×2 because of weight constraints. Discussions began with Irizar who were enthusiastic about the idea, swiftly producing layouts and specifications. A fortnight later Ausden Clark ordered the first example and another order has since been placed by Carvers, with ‘quite a bit of interest’ from other potential customers. The specification of the 13.6 long coach includes 80 Prime Passenger Seating seats with all-age seatbelts in a 3+2 configuration. Seating capacity is maximised by the use of the same rear door arrangement with fold out steps found on i4 Scanias supplied to Translink. Tony confirmed that it would be possible to supply the iSkool with a bespoke specification if customers wanted features such as dark glass or DVD systems and monitors. He also saw no reason why examples meeting DDA specifications could not be built, though this would require a centre door and wheelchair lift. As reported in last week’s issue, agreement has been reached with the Spanish manufacturer, Ayats, to supply chassis on which it will be mounting the Eclipse coach body. The model will be sold exclusively through Ayat’s UK distributor, Ayats UK Coach Sales, for the UK market, but not in Ireland. Scania will be providing warranty on the chassis element of the coach and there will also be extended warranty options with the possibility of R&M deals if negotiated locally with a dealership. 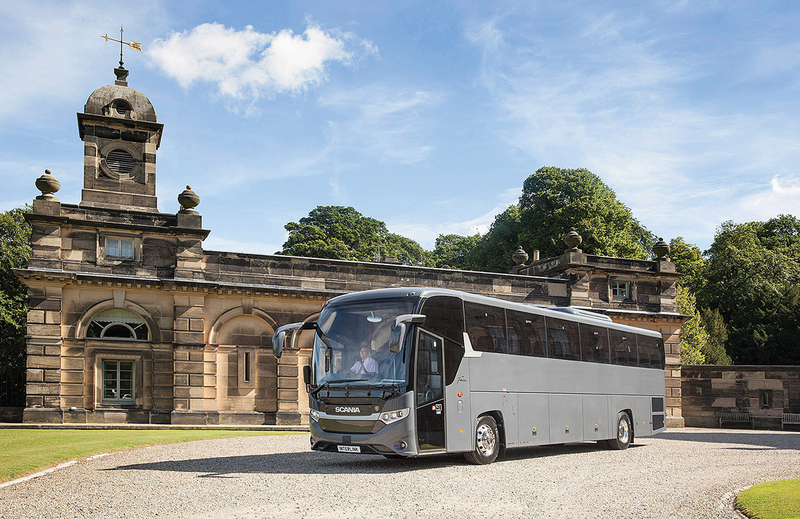 The coach offers a seating capacity of 80 passengers and gives Scania customers a useful additional double deck coach option. The first Eclipse bodied Scania has already been ordered. Something customers had welcomed was the handover App that had been developed for the Touring. 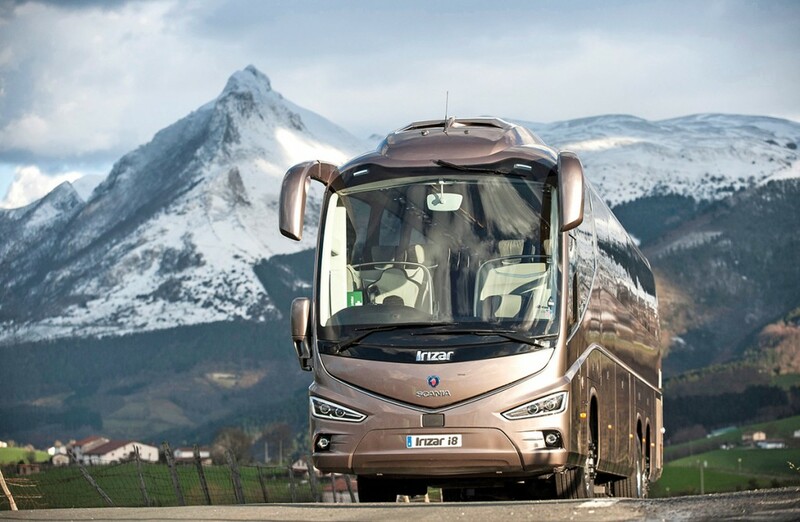 One was now going to be produced for the Interlink and probably for the Irizar range as well. To complete his presentation, Tony spoke of the success of the used vehicle operation with 176 units sold in 2016. This was aided by the launch of a new used App and also by the quality of stock offered. It was something the company was very proud of. 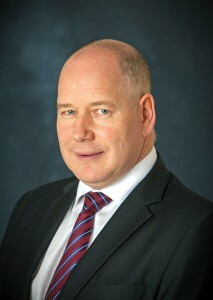 Aftersales Director, Scania, Great Britain Ltd, Mark Grant. Mark Grant, Aftersales Director, reported that 2016 had been a very successful year for the Aftersales operation, with record earnings for the fifth successive year. Parts sales were up 7.85%, though the quality of the current Scania vehicle range was limiting the potential for growth. One way the company has sought to maintain growth is by expanding the range of VRS (Vehicle Related Services) offerings. VRS began by offering trailer parts in 2013 and the following year added a consumables range. The latest addition is an all makes truck catalogue which has the added benefit of helping to support the business’s Vehicle Maintenance Unit (VMU) programme which manages customer workshops on their behalf. Across Scania’s workshop network, including trailers and non Scania vehicles, a 97% first time MOT pass rate figure has been achieved. In a statistic whose background bus operators are all too familiar with, Mark reported that the average time taken for Scania Assistance to arrive at a call out was 59 minutes, up from 55 minutes three years ago because of the impact of growing congestion. A big development had been the recent investment in the Scania Technical Centre at Copt Oak near Loughborough. I won’t go back over this as we carried a full report in last week’s issue. Of note was the fact that 50 technical and 12 parts apprentices were recruited last year, taking the total number of current Scania apprentices to 224. With over 800 apprentices trained since 2008 and a 97% achievement rate, Scania plans to recruit a further 80 to 85 individuals to start in September this year.